The Angriest: Star Trek: Deep Space Nine: "The Ship"
It is 7 October 1996, and time for an episode of Star Trek: Deep Space Nine. While on a mission in the Gamma Quadrant, Captain Sisko (Avery Brooks) and his team find themselves marooned on a desert planet but in possession of a crashed Jem'Hadar spacecraft - and when the Jem'Hadar come to retrieve their property, Sisko is disinclined to surrender it. The Deep Space Nine writer's room certainly doesn't waste time getting back into war with the Dominion. Just one episode after wrapping up the Federation-Klingon War, the DS9 crew are trading blows and gunshots with the Dominion's best shock troops in this 42-minute war movie packed with stereotypes and smart ideas in equal measure. There is a clever idea at the episode's core: that the Jem'Hadar don't want their shop back, but instead they want the Starfleet officers to get out of it so they can retrieve whatever secret object in their ship that they do want. 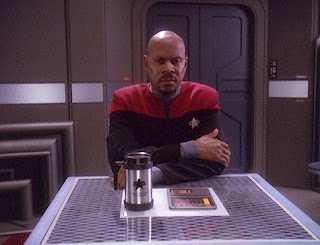 It is a neat conceit and does lead to an emotive climax, with Sisko bemoaning how the entire crisis could have been averted had both sides been willing to sit down and talk. It also leads to an excellent and effective epilogue; it's just a shame that it isn't entirely earned by the rest of the episode. As I've noted, there are a lot of stereotypes. It's goodbye to Muniz (F.J. Rio), the technician that previously appeared in "Starship Mine" and "Hard Time". It's not as if the series particularly highlighted the character until now, but it is nice that they build these soft pieces of continuity into Deep Space Nine when they can. F.J. Rio manages to make him quite an appealing character for his final appearance, but while the dialogue delivers some funny banter between him and O'Brien (Colm Meaney) in the episode's early scenes by the end it's a maze of cliches. I'm genuinely surprised he didn't tell O'Brien that he couldn't feel his legs any more, or that everything had gone dark. The episode also continues with Deep Space Nine's weird penchant for making Worf (Michael Dorn) weirdly unlikeable. Here he barks a variety of insensitive comments about Muniz's bleeding-out and is antagonistic towards O'Brien without reason. I have no idea why Deep Space Nine perverted the character in this way, but it is starting to ruin Worf. At the same time Dax (Terry Farrell) is made remarkably snarky and unpleasant. It all damages the episode. This episode is weird: it's a strong framework and premise that suffers a death of a thousand cuts by odd character choices and wall-to-wall eye-rolling cliches. It leaves Season 5 running 50/50 after its first two episodes.